Brazilian midfielder keen on Chelsea contract extension? 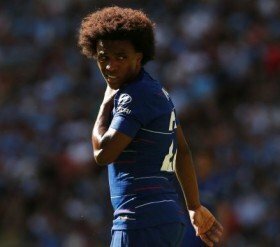 Chelsea winger Willian has reportedly grown frustrated amid the Blues' reluctance to discuss a multi-year contract for his services. The Brazilian has spent the past five-and-a-half years at the Blues and he has contributed over 50 goals in 273 appearances across all competitions. According to UOL Esporte, the likes of Barcelona and Paris Saint-Germain are looking into a potential move for the attacker in the summer but the 30-year-old would prefer staying put with the Blues. However, the report states that the Blues are reluctant to offer him more than a year's extension which remains their policy with players above the age of 30. Willian is said to want at least a three-year contract with the west London giants to prolong his stay until 2022 but so far, the club have remained reluctant to change their stance. The Brazilian recently started the Blues' 5-0 triumph over Huddersfield Town in the Premier League and he made his contribution with a second-half assist.